VFL: Round 10 win in 60 seconds Get a snapshot of the 2-point victory over Box Hill in 60 seconds with Collingwood Media. Darcy Moore kicked three goals and captured the excitement of fans during his stint at full forward for the VFL Magpies. Photo: Shane Barrie. Exhausted players fell to their knees. Some fans cheered while others caught their breath. Opposition coaches wondered what could have been. The post-match script of the VFL Magpies thrilling two-point win over the Box Hill Hawks played out in a manner which has almost become second nature this year. Five of Collingwood’s nine games have been decided by under ten points, with four of these going the way of Dale Tapping’s side. “We enjoy it. What you do see is individuals grow in these sort of moments,” Tapping told Collingwood Media post match. VFL: Click here to view each profile and headshot for season 2015. With the margin barely extending beyond two goals for the entirety of the game, Magpies’ captain Jack Hellier won a free kick and calmly gave his side a two point lead with minutes remaining in the game. The home side held on in front of thousands of excited fans and handed Box Hill just its second loss of the season. “It was a great result in the end against a real quality outfit,” Tapping said. “We knew going into the game that they were going to be really strong and have a lot of depth. While depth proved a strong-point of both sides going into the match, both sides failed to maintain a full interchange late in the final term. Ben Sinclair was rested after successfully completing three quarters in his return from injury, while Ben Reid, Clinton Young and Brenden Abbott all spent lengthy periods of time on the interchange. Development Manager Craig McRae told the Herald Sun that the decision to bench Reid was designed to help manage the defenders work load as he returns from injury. "He has had a history of soft tissue injuries in the past couple of seasons and we wanted to play (it) safe," he said. Similar concerns stemmed from the Box Hill bench with captain David Mirra needing crutches to depart the ground, while Matthew Spanger left the field in the hands of the trainers. 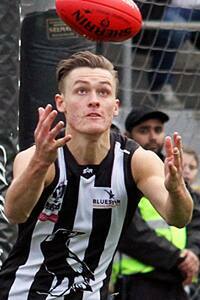 Aided by a pair of bright yellow boots, Darcy Moore stood out for the VFL Magpies as a high-flying full forward. The 19-year-old took a number of strong marks and kicked three crucial goals. Patrick Karnezis showed his ability to adapt to multiple positions with a three-goal haul, while Ben Moloney dominated in the midfield with 35 disposals and a number of bruising tackles. The early afternoon start capped off a whirlwind three days for Jonathon Marsh and Brayden Maynard who both travelled to Perth as AFL emergencies for Thursday night’s clash against Fremantle. With the learning experience fresh in their mind, they impressed in defence and were both among the coaches’ selection of best players. AFL senior selection will no doubt be playing on the minds of the pair, as it will for the likes of Reid, Levi Greenwood and Matthew Scharenberg. For the remainder of the list, a clash with Sandringham next Saturday beckons. If the nature of this season is anything to go by, another thriller awaits.